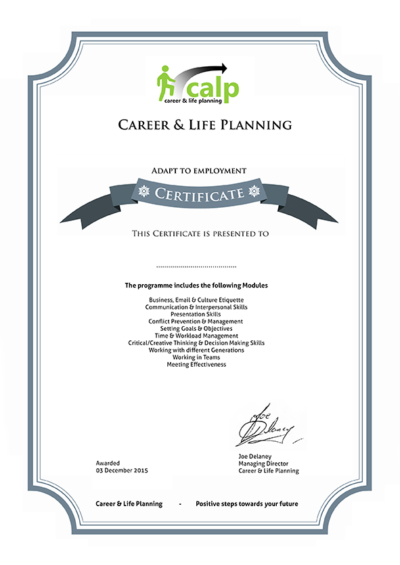 Career & Life Planning has developed the Adapt to Employment Programme to assist jobseekers in their transition back into the workforce. This programme includes 10 modules on core skills required by companies to ensure the jobseeker is fully prepared for entering the workforce. The programme ensures the jobseeker is not only aware of the competencies required but learns best practices in a blended learning environment combining both theory and practical application of skills. The Adapt to Employment programme will ensure that the jobseeker can transition smoothly into employment. This program can be delivered in single modules or can be delivered as an overall program. Delivery is flexible with regards to duration, dates, location and completion. This programme can be combined with other products & services from our Activate range.